Despite what you may think, Green Coffee Bean extract does not use caffeine to promote weight loss and energy. Actually, it's the chlorogenic acid in the green coffee bean that inhibits the release of glucose in the body while boosting metabolism and burning fat in the liver. Chlorogenic acid is also a strong antioxidant. The reason green coffee bean is used in pill form for the health benefits is because if you roast the green coffee beans to drink it, the process removes a lot of the chlorogenic acid, making it much less effective. The daily dose is 2 capsules with water, up to 2 times a day. Generally I only took 2 capsules a day, which is 400 MG. (Full daily serving is 800 MG.) The pills are smaller than normal supplements so they are easy to swallow. They are also rapid-release capsules, so you want to be sure to drink plenty of water with them. I did not experience any aftertaste or negative side effects. Mainly I experienced good energy and less bloating while taking Green Coffee Bean extract. For me, it was a good supplement to take at the beginning of my weight loss efforts, since it helped give me the energy to keep going. I also assume it was working "behind the scenes" by inhibiting glucose and such. This must be the reason it seemed to help with appetite control as well - less blood sugar spikes. Now that I know how Green Coffee Bean affects me on its own, I'm going to try taking it in tandem with Garcinia Cambogia and Raspberry Ketones. I have read that they are most effective together, and figure I will try it since I've had a good experience with all three separately - we'll see what happens! 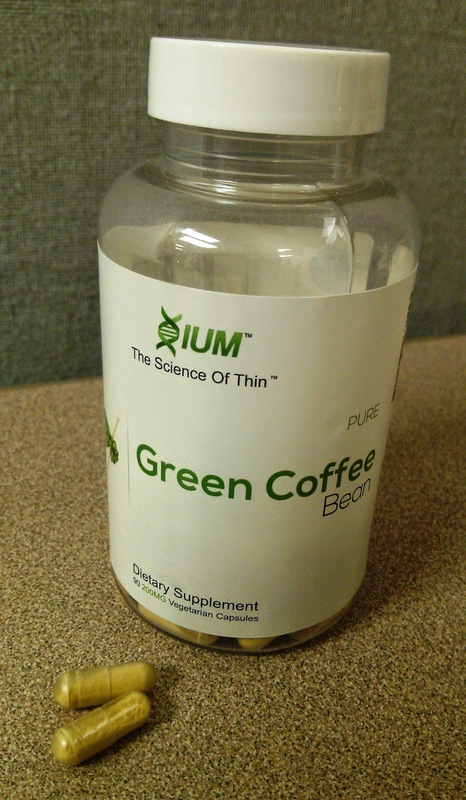 Xium's Green Coffee Bean extract is made in the USA and less than $10 for a bottle.